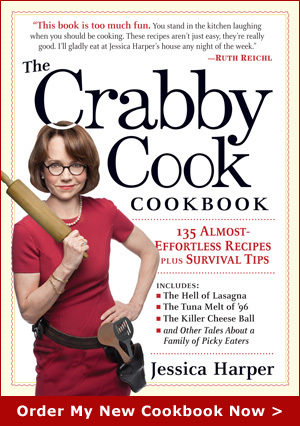 The Crabby Cook – Jessica Harper» Blog Archive » Sam Cooks! In a stunning development,, my brother Sam is learning to cook. It’s stunning because, in all the years we spent growing up in our large, traditional Midwestern family, the only male contribution to the evening meal was the belching. Sam admits that the latter category is the one most often selected. His blog currently features a photo of a one recent I.D.G.A.S.W.W.E. Platter that consisted of a few limp spinach leaves and a nicely grilled, bun-free hot dog. Okay, so the photo doesn’t inspire you to invite yourself to the Harper house for dinner, but I insist that Sam is a chef-in-training with unlimited potential and I look forward to seeing what he comes up with next. With any luck, maybe his belching brothers (and even maybe my husband) will follow suit….. This entry was posted on Friday, February 8th, 2013 at 2:33 pm	and is filed under The Crabby Community. You can follow any responses to this entry through the RSS 2.0 feed. You can leave a response, or trackback from your own site. LOVE all of this except the part where you say he lives “…in a home where domestic duties have always been equally shared”. ohhhh, well, okay, i guess I guess I should amend that to say “dishwashing duties”! S’ma bro yip go go! 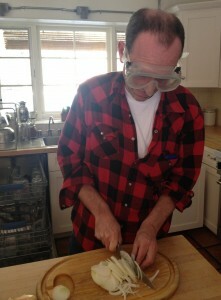 Is Sam wearing goggles to cut up an onion? Good Valentine gift for those with smelly hands. Tell Sam that when I started cooking for myself again I found it to be quite time saving to move the Band Aids from the medicine cabinet to the kitchen counter. Good for him, some men do cook and do it well. I would cook for you anytime, Jessica! The goggles not only look funny but also very big!